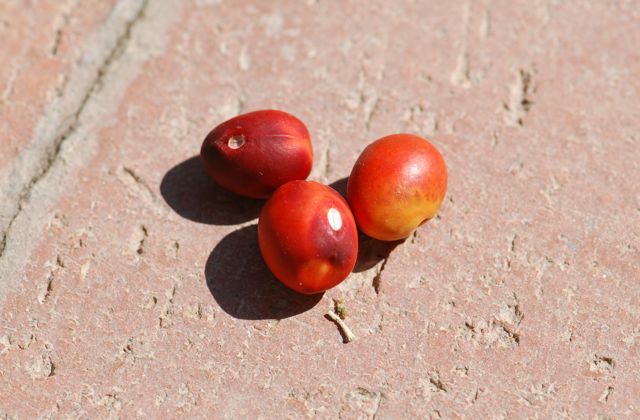 The red mystery beans from last week are from a Texas Mountain Laurel or Mescal Bean, Calia secundiflora or Sophora secundiflora. Ironically, this is one plant that I can identify by what is eating it. 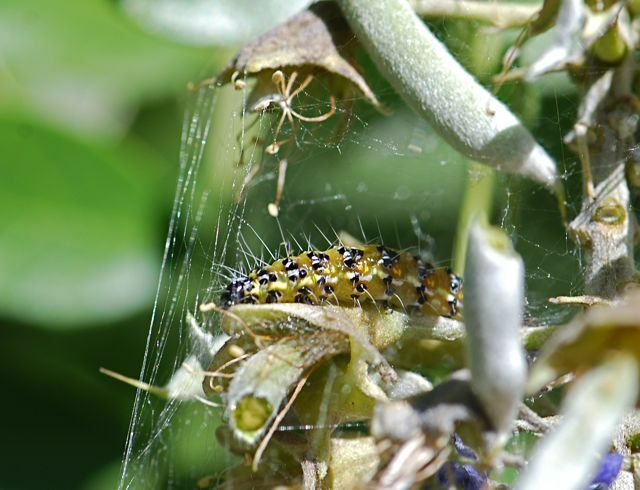 The fuzzy larva shown here is the genista caterpillar. They are often found feeding on Texas Mountain Laurel plants in the spring, causing a messy webbing. The caterpillars pupate, and then emerge as brown moths. Photograph by Miwasatoshi, retrieved at Wikimedia. The flowers give off a lovely, sweet scent reminiscent of grape soda. Texas Mountain Laurels are large shrubs or small trees that are commonly grown in landscapes. Originally from Texas and surrounding areas, they grow well in the desert. They have small, leathery leaflets, and stay green throughout the year. 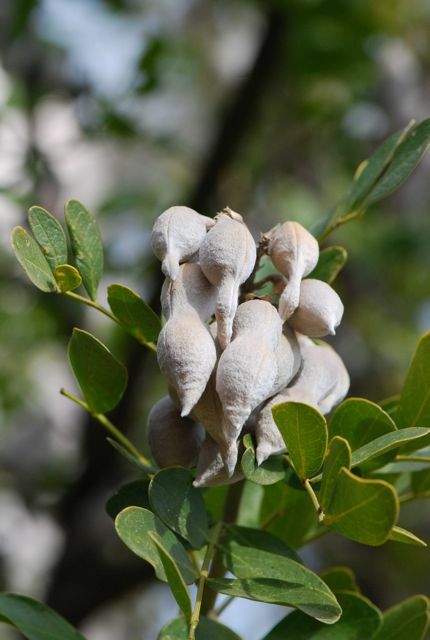 The seed pods are silvery and have a fuzzy appearance. The pods are swollen around the seeds, and come to a point at the end. The red seeds inside contain an alkaloid that can be toxic if eaten. The good news is that the seeds are also very hard. In fact, they are so hard that it is difficult to propagate the plants from seeds. Experienced gardeners recommend scarification, a process of abrading the seedcoat to make it more permeable to water. 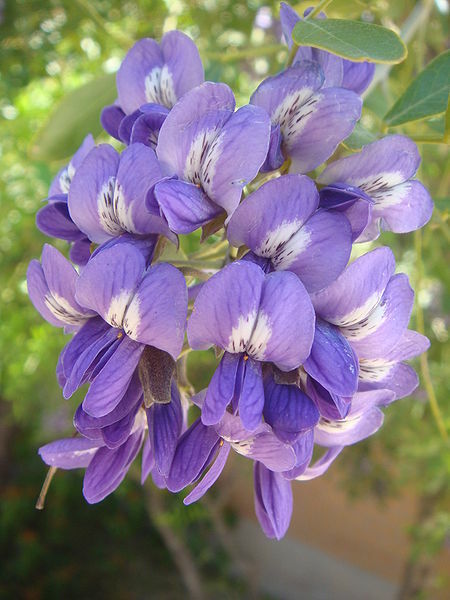 Have you ever seen a Texas Mountain Laurel in bloom? Did you think it smelled like grape soda? Ahhh...I should have known. I love entering DBG and smelling the one just inside the entrance. My kiddos and I always stop. My neighbor grew TML adjacent to my property. While mowing the grass, I noticed marble size or smaller red seeds all around. I remember seeing these as a kid. In fact, kids in the neighborhood rubbed them on the pavement until they got really hot. Although they are difficult to propagate, I am going to try scarification. Thanks for the tip. That's funny that the kids were essentially scarifying them.